Spirit Ridge Resort is located in Canada’s “pocket desert,” where golden light filters through antelope bitterbrush right before breathtaking Okanagan Valley sunsets. Here is where you’ll find Spirit Ridge, nestled between rolling hills and Osoyoos Lake in the heart of Canada’s wine country. During your stay, discover the history of the Osoyoos Indian Band at the NK’MIP Desert Cultural Centre, and watch high-octane racing at the Area 27 racetrack. 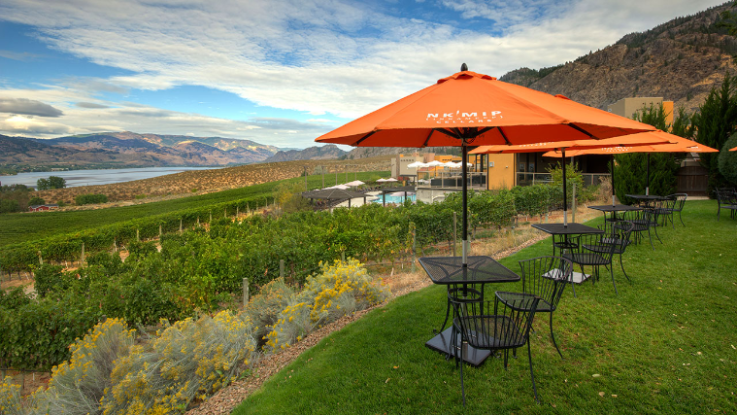 Watch the glittering waters of Osoyoos Lake as you dine alfresco at NK’MIP Cellars Winery Patio and share a bottle of wine with friends. Enjoy elegantly plated wild mushroom gnocchi and duck confit sandwiches as you gaze at the serene desert landscape. Our farm-to-table specialties are created using traditional aboriginal techniques. Solterra Desert Spa is situated in beautiful wine county in the South Okanagan in British Columbia. Solterra Desert Spa is a privately owned and operated full day spa that is located at Spirit Ridge Resort in Osoyoos. It was open in 2007 and offers year round refuge as a unique spa getaway in Canada’s only desert. Solterra Desert Spa offers treatments to soothe your mind, body and spirit while you are in the area perusing the amenities Osoyoos has to offer. If you want to understand Okanagan Valley history, start here. Built right into the landscape, the NK’MIP Cultural Centre extends into a hillside, and its sustainable design features a living roof of desert plants. Inside, exhibits focus on desert ecology, wildlife, and the culture of the Osoyoos Indian Band. Wander along two kilometers of walking trails to explore the environment at your own pace. The whole facility is steps from your room. Prize stay must be completed by May 31, 2018. The value of the Grand Prize is $2,070.